Recent advances in genetics and understanding how the brain works raise the possibility that intellectual developmental disabilities are treatable and some actually may be reversible. “That is just mind-boggling and it is dazzling,” Elisabeth Dykens, Ph.D., director of the Vanderbilt Kennedy Center for Research on Human Development, said last week during the Kennedy Center’s annual Science Day. 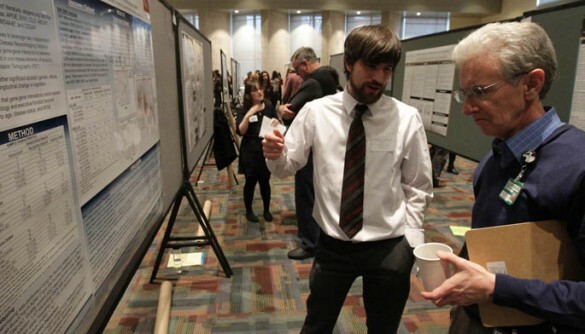 Nearly 200 people listened to scientific presentations and viewed dozens of research posters at the Student Life Center during the Jan. 15 event, organized by a committee chaired by Kennedy Center investigator Jennifer Blackford, Ph.D., assistant professor of Psychiatry. Dykens’ theme of progress amidst challenge was echoed by a new Kennedy Center video produced by center investigator Blythe Corbett, Ph.D., assistant professor of Psychiatry, and shown at Science Day. “Having a mutation doesn’t mean we can’t influence it,” continued Karoly Mirnics, M.D., Ph.D., James G. Blakemore Professor of Psychiatry and associate director of the Vanderbilt Kennedy Center. These advances have “been an enormous breakthrough, an epochal breakthrough,” added Tim Shriver, Ph.D., chairman and CEO of Special Olympics and a member of the Vanderbilt Kennedy Center’s national scientific advisory board. “I only hope that all of the science will be marshaled in an unconditional way to support the quality of life of people with intellectual and developmental disabilities and forever open our eyes to the goodness, hopefulness (and) happiness of these important and unique citizens,” Shriver said. To see the video and Dykens’ keynote address, go to http://kc.vanderbilt.edu/site/newsandevents/podcastandvideo. The Vanderbilt Kennedy Center is supported by major grants from the National Institutes of Health, including 5P30 HD015052.